Eddie has worked hard. By age 8, he was changing his infant brother’s diaper. Eddie’s mom tirelessly worked two jobs while putting herself through college. In those early years, Eddie’s father was incarcerated — causing Eddie to take on some of the household responsibilities. Eddie’s mom found Jubilee member school, The City School. Eddie’s dad came home while Eddie was in middle school. Eddie fondly shared his memory of helping his dad rebuild his “birth home,” the home Eddie’s dad owned. Eddie loved to build and create with his dad. That memory and his mother and grandmother’s influence inspired Eddie to be become an engineer. 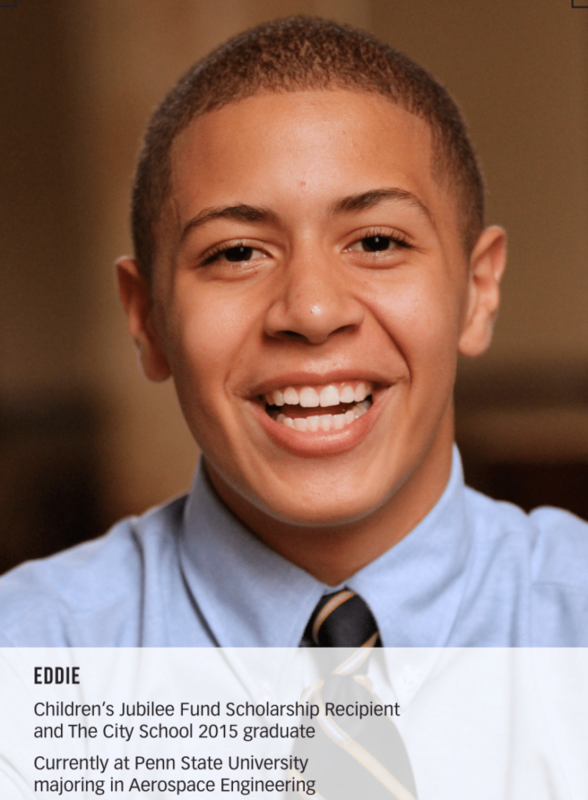 When teachers at The City School learned of Eddie’s dreams, they encouraged him to “write a plan” for his future. That written plan is taking shape today. Currently enrolled at Penn State University, he majors in Aerospace Engineering. Eddie, on a scholarship with ROTC, plans to complete college, pursue a master’s degree, and become a pilot, and perhaps serve as an aerospace engineer. Thanks be to God for the influence of his family, The City School, and the help of Jubilee donors for investing in his future — the fruit of which is already evident. When you first meet 19-year-old Brian Vazquez, he greets you with a strong handshake. He’s a tall, lean, clean-cut typical college student. His story, however, is filled with hardship,overcoming adversity, and hard-work. At age seven, he moved with his family from Puerto Rico to Kensington—a troubled neighborhood of Philadelphia. His father worked as a forklift operator; his mother raised and cared for him and his three brothers. Over the years, Brian was in and out of numerous schools. By 7th grade, along with the challenge of learning English, he was overweight and was subjected to verbal and physical bullying. His self-esteem plummeted, he had poor grades, and he was placed on academic probation. Anxiety, depression, and obsessive-compulsive disorder plagued him. The turning point came the following summer. 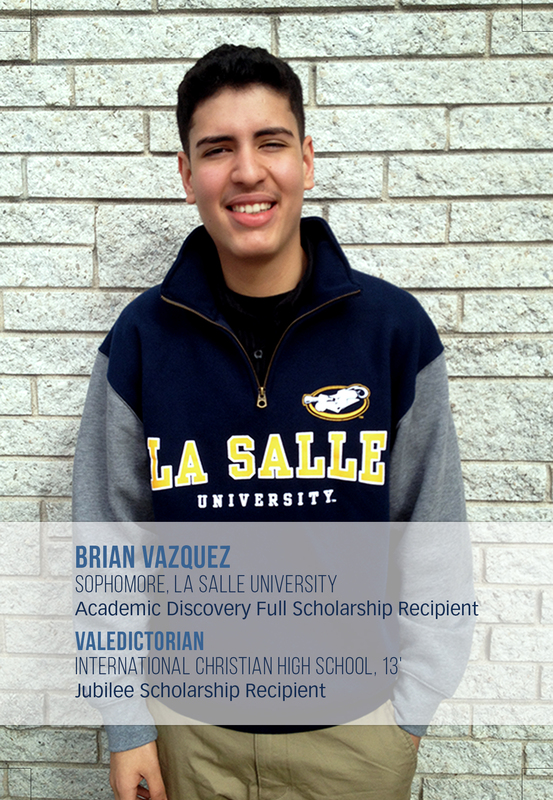 God led Brian’s parents to International Christian High School, and—with a Jubilee scholarship—Brian had a spot in a school where he could learn. He remembers that first day. “My mother almost had to push me out of the car due to my intense anxiety.” Despite his fears, he was able to make friends easily. And for the first time in Philadelphia, Brian felt safe at school. Challenges remained, however. Because Brian’s writing was incoherent, his English teacher encouraged him to work hard to keep up with his classmates. “I desperately wanted to stay at International,” Brian shared. Over the next four years, he worked harder than ever before, and he succeeded. He was scheduled to graduate as valedictorian. But, his family owed the school $3,000 in tuition, which meant that he was unable to receive his diploma. International allowed him to attend graduation, to celebrate with his friends, and to give his valedictorian speech, which he delivered with joy. And by summer’s end, Brian had saved $1,000 from his job; his father and other family members had raised the balance due, and Brian received his diploma. The story doesn’t end here.